Running a business can be full of life lessons. Shortly after I became the managing editor of the Knoxville Focus Newspaper, I learned a very valuable lesson. A great team is worth more than gold, and that one bad apple, can spoil the whole basket. It was a hard lesson to learn, but it has served me well over the years. I had been in management roles before, but I was never in control of who to hire and who to fire. This was my first foray into that aspect of Human Resources. I inherited a good team and everything went great for a while; but as we grew and things changed, people left for one reason or another and I found myself needing to replace team members. After a long time employee left the front desk position, I had to begin the search for someone to fill that very important position. The person had to be good with people, able to multitask, take classified ads, invoice customers, do collections and work with route carriers, all with a pleasant attitude. After going through countless resumes, I thought I had found the perfect candidate. On paper she had the skills, her background came back clean, she interviewed wonderfully. I thought I had found the missing piece of the puzzle. Sometimes, what seems to be, and what actually are, can be very different things. After training was complete and a few months of settling into the position, she became comfortable, too comfortable. The nice portion of her facade began to crack away and something witchy, this way came. At first I tried to be tactful and ask if there was a problem, then I tried to counsel, finally a write up. Other members of my team were complaining about invoices and tearsheets going to the wrong people, messages not getting to them and worse, leads not getting to them. The writing was on the wall, I was going to have to lower the ax. It was just after Thanksgiving, and being the nice person I am, I felt that if I could just hold off until after the holidays it wouldn’t be so hard on the lady. I mean who wants to get fired at Christmas? It just wasn’t meant to be. After walking in the office and hearing a very loud, rude conversation with a customer, I fired her on the spot and escorted her from the building. I felt horrible. I was Ebeneezer Scrooge! Thankfully, the rest of my team breathed a collective sigh of relief and rallied around me. It was then, that I knew I had done the right thing for the business and the team. It wasn’t until Christmas week that I knew how deeply this bad apple had actually effected everyone else.I believe in open and honest communication, so I encouraged dialog. I needed to know where I had gone wrong. Things came to light that no one wanted to talk about before, I learned a few things. we cleared the air and started fresh. Christmas eve, my sales manager walked into my office with a gift from her and her husband. She snickered as she handed me the box. She had an air of childish mischief about her and I knew it couldn’t be good. Much to my surprise, I opened the box to find a gleaming hatchet with a huge red bow on it. Seems she had told her husband about it all and he figured that if I was going to have to give people the ax, I needed the proper equipment. Then I hung it on the wall above my desk. For my next 4 years at the paper, everyone I interviewed had sit across the desk from me and look at that hatchet adorned with a big red bow. It was a constant reminder to me that sometimes you have to do the hard things, prune the deadwood from an organization, for the good of the whole vine, too keep things growing and going in the right direction. They either got the symbolism in the conversation or they left thinking I was an ax murder. Since things went really smooth after that, I’d like to think they got the symbolism. 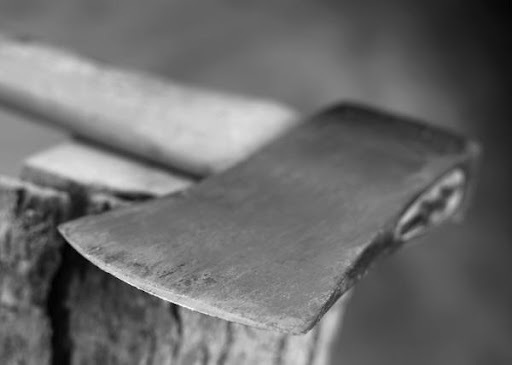 I’m way too nice to be an ax murder, I’m just the hatchet lady. Well, I must apologize for being slack in my blogging for the past few months. The only excuse I can give is life. It seems that lately I have had an over abundance of life coming at me from all directions. I know I am not the only person in the world that feels this way. But sometimes don’t you just want to scream, “hey, slow this planet down, I want to get off now.” As if life were a ride at an amusement park, and you had too much funnel cake for your own good. This week life has been just like that. A roller coaster of ups and downs so severe they take your breath away and knock you back in your seat. My work life is always hectic, but when our office manager quit, work became more intense. Don’t get me wrong, I love my job, I am a public relations and marketing manager for a manufacturer of specialized therapy equipment for people with mobility issues. It is an amazing piece of technology called the Quadriciser Motorized Therapy System. My job is multi-faceted, I get to travel and meet some truly amazing people in my work, I get the opportunity to be creative and steer our marketing into the 21st century, but when you work for a small company, you wear many hats and sometimes it can be overwhelming. If work were the only part of my struggle, there would be some stress but I could deal with it. I was a military wife for years, and as long as no one is shooting at my husband, I’ve always felt I could roll with just about anything. So work stress would be the kiddie version of the roller coaster. It looks intimidating when you 5, not when your 8. Do you know what I mean? But then, you add the stress of an aging mother, (who I love greatly, but is as stubborn as the day is long, and no matter how you explain it, she still won’t take the medication she is suppose to, like it’s prescribed), the stress of your own health scare and a need to get healthy before things get out of control, the stress of a leaky roof, (that will have to be completely replaced), a lawn mower that decided it wanted to be separated from its gas tank, so it just fell apart, (and we really need a tractor to cut the grass on a farm not a mower) and as of tonight, a refrigerator that just went kaput, all those things in very close proximity to each other, and none of the money to do anything about any of it…well that has put me on the Big Daddy of Roller Coasters this week. All those downs make me want to get off this ride and run screaming from the park. Not to mention, they are exhausting. I need a nap just writing about it. However, without the downs of my roller coaster ride, I could never truly appreciate the ups of my roller coaster ride. The ups are like soaring on eagle’s wings. Without the troubles, I would never appreciate the positive aspects of my life. I have a Father who loves me regardless of troubles and in spite of all I have done wrong in this world, I have a husband who is my best friend who cares what I think and appreciates me for who I am and loves me even when I am rotten, I have a mother who I get the privilege of embracing as she imparts her wisdom and love on me and I cherish these times because I know she won’t be here forever, I have a church family and friends who will pray with me when I’m scared, confused and when I cry out to God for guidance or grace, I have a good job and boss who appreciates the work I do, I have a home with a warm bed and food to eat. Wow, not a bad life. How many people have less than that at this very moment? Without the perspective the of the Ups, the Downs look devastating with no end in site. We can’t always be on the Up, but we can know that when the Downs happen, an Up can’t be far behind. I hope my trials and tribulations this week can encourage you to know you are not alone in your daily struggles. We all are on this ride together. Some days its the kiddie roller coaster and others its the Big Daddy roller coaster. Whichever it is, appreciate it, throw your hands up and laugh, this ride goes by to fast.